The status quo is failing to address the devastating life experiences of children and families living with intergenerational inequity and disadvantage in Australia. We don't accept the status quo. We have reformed five key areas to redress existing failings and to evidence a new system to achieve long term impact. Local governance is the single most important principle and practice in our approach. We place priority on people's ability to govern their own affairs. It is only by securing the consent, direction, support and active involvement of the community that enduring change will be achieved. Our Board of Directors provides leadership and accountability. The Board is highly skilled and qualified in their respective fields. They have the capacity and tenacity to pioneer an ambitious change agenda. The Board includes leaders with expertise in social, health and education sectors, fundraising, financial management, human rights, social innovation, research and evaluation, communications, entrepreneurship and stakeholder relations. Children's Ground's unique two-tiered governance model blends strong central stewardship with local community ownership and engagement. Our workforce reform prioritises the employment and training of local people. The long term aim is building a skilled, sustainable workforce for the regions in which we work. We recruit cultural and sector experts to implement our bicultural skills and learning approach. We have ‘no barriers to employment’, encouraging engagement of long term unemployed people. Importantly the employment is meaningful and responds to people’s skills, talent, interests and personal situation. Jobs include: teaching, nutrition, community engagement, communications, maintenance, community development, health, research and enterprise. Children’s Ground tackles the social, structural and economic factors critical to addressing extreme poverty for the communities in which we work. We do this by shifting from single issue responses to a comprehensive, integrated response: the Children's Ground Platform, responding to the multi-level influences on children’s development from pre-birth to 25 years. 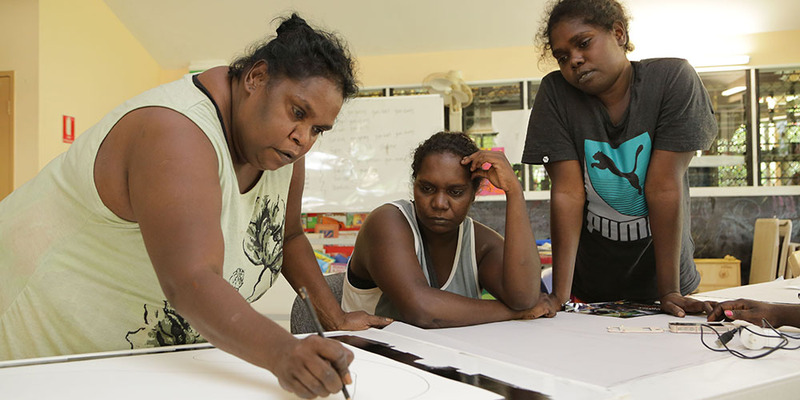 We celebrate the Aboriginal world view that connects the development of the person to the land and the people in a sophisticated system. Our Platform combines education, health, wellbeing, society, law, philosophy, environment and culture. We have a 25-year evaluation framework to evidence our impact and inform future policy and practice. It will take a generation of high quality opportunity to create long term outcomes with communities. Our evaluation strategy will monitor progress. By year three of implementation we expect to evidence significant progress in nine key outcome areas. Our impact will only be truly tested in a generation, when the current children are adults and we are able to reflect on the cultural, economic and social reality they and their children enjoy. In the meantime we are tracking this change so that we can be sure we are on the right path. 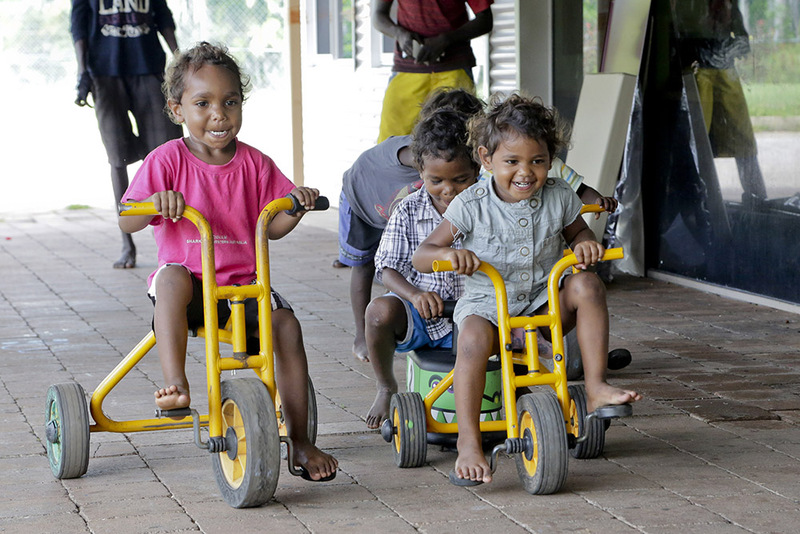 Read the results of our first two year's of work with Bininj (Aboriginal) children and families in Kakadu West Arnhem in our Progress & Evaluation Report 2016. Our ‘collective investment in outcomes’ approach is designed to secure funding on terms that allow Children’s Ground to maintain program integrity and clarity of our aims, direction and measurement. This requires sufficient funding to deliver excellence over the long term and to create the conditions for flexibility and innovation to evidence a new approach. Accept that the change required is generational, rather than a quick fix.